After our long day riding elephants and swimming in waterfalls, the last thing I wanted to deal with was the sound of banging drums at 4:30 am. I failed to mention this earlier about Le Bel Air, but its proximity is close enough to a wat that you’ll be able to hear the beating of drums early in the morning. It’s not obnoxiously loud, but if you’re a light sleeper bring your earplugs. Our plan for the day was to take a relaxing river cruise down the Mehkong River to the Pak Ou caves and Whiskey Village. We booked the cruise through the hotel, and for $35 (US) the cruise takes you to those two locations and includes lunch. Our boat was the Nava Mekong. It’s a little higher end than the cheaper cruises in that the boat was bigger and had table settings for meals. The cheaper cruises were more like the traditional Lao long boats, but covered. For obvious reasons, only do a river cruise if the weather is nice out. I say this because the cruise itself was probably the best part of the tour since the two destinations weren’t exactly that amazing. The Whiskey Village, which we had high hopes for, turned out to be nothing more than a few shacks with women selling bottles of whiskey. Don’t get me wrong, seeing the jars of whiskey with giant scorpions and snakes was awesome, but we were hoping that there was a factory or something. Instead, all the Whiskey Village was was a very poor moonshine outpost. That being said, since we were there we did try some whiskey. It tasted like very strong Saki, not bad but nothing to write home about. We did purchase a few bottles however because they do make great display souvenirs. From there the cruise headed to the Pak Ou caves, which was the cooler of the two stops. The caves are split into an upper and lower cave and house several hundred mini Buddha statues. The upper cave is a bit of a stair climb to get to and don’t forget to bring a flashlight (our iPhone flashlights worked perfectly well) because the upper cave is pitch black inside. It definitely made the spectacle of seeing all the Buddhas a bit more exciting and mysterious. On the cruise back, the Nava Mekong offers a pretty delightful lunch made up of samples of Laotian cuisine and then you’re back in Luang Prabang by around 2. We headed for a quick spa session at Hibiscus Spa, which provided a really good massage, but I wouldn’t recommend going there if you’re looking for friendly employees. These people were polite and all, but definitely seemed exhausted and looked like they didn’t want to be there. After that, we went to our favorite dinner experience of the whole trip. Tamarind is one of the top restaurants to try in Luang Prabang. They offer a cooking class that is recommended in several guidebooks and in hindsight we probably should have taken the class instead of going on the river cruise. Regardless, we went there for dinner and it could arguably be the best meal we had the entire trip. The employees and Tamarind obviously have a genuine interest in showing their patrons what real Laotian food is like. The menu is very in depth; it’s part history lesson on Laos food, part FAQ on best practices for cooking and eating Laos food, and part course offerings. What impressed us was the fact that although we took a good 20 minutes reading the history/FAQ in the menu, the wait staff didn’t disturb us the whole time. It was only when we clearly had finished reading that our waitress politely came by and asked us if we had any questions. The food at Tamarind is authentic and excellent. The tasters appetizer is like a Laos charcuterie with an assortment of sausages, veggies, sauces, spices, and other meats and is a must try. The Buffalo Laap was also a highlight and that is a ground buffalo meat dish with Laos spices and tripe (apparently Laos style includes tripe). The coolest part of the meal is how you eat all the dishes using the sticky rice. Essentially what you do it take the sticky rice, roll it into a small patty with your hands, and use its stickiness to scoop up all the food. It’s kind of like how you eat Ethiopian food with you hands, but instead of injera the Laotians use the sticky rice. For desert, the Watermelon Chili sorbet is awesome; it’s cool and refreshing with a tiny bit of kick at the end as you swallow. And the whole experience was cheap; it only cost $40 for two people. A definite must-try meal in Luang Prabang, and I plan on returning sometime in the future for the cooking class they offer. After our outing with the elephants, we made our way to what is on pretty much every Top 5 of Laos list — Kuang Si Falls. Because we had already pre-arranged this at the hotel, our driver picked us up from the Elephant Village and drove us the 30-45 minutes to the falls. If you take the excursion out there on your own, I would highly recommend getting a driver with an actual car as opposed to hiring a Tuk Tuk. The road there is dusty, bumpy, and windy and would be very uncomfortable on the back of the rickshaw. The entrance fee for the falls is 20K kip. Be sure to bring a bathing suit and towel because even if you don’t think you’ll want to go in the water, you will once you see it. The Kuang Si Falls are a beautiful emerald-jade color with hundreds of butterflies that flutter all around; it truly lives up to the hype. The first watering hole you approach at the falls is by far the biggest and busiest. Don’t make the mistake of thinking this is the only watering hole out of the excitement of seeing it first. Keep walking up and you’ll see that there are about 7 or 8 watering holes and they get progressively less and less busy as you keeping walking up the hill (that being said, the first watering hole does have a tree that you can jump off of into the water). As you make it up the hill, you’ll eventually reach the apex of the falls which is a giant 200 ft. waterfall. At the bottom, you can take some great pictures and there is a trail that will take you to the top. Now when we tried to hike up this, we were both wearing flip flops, making it nearly impossible. So if you want to hike up to the top, be sure to wear shoes. Also, the climb is incredibly steep, like on your hands and knees steep. It is not for anyone who isn’t in peak physical shape. As we were struggling to get to the top, we asked the folks coming down if it was worth the effort. Most, if not all, said “No”. The general consensus was that the view wasn’t really that good at the top and you may as well just take more pictures from the bottom. So it’s up to you whether you think the climb is worth it. We eventually settled on a water hole 2/3 of the way up from the bottom of the trail and hung out there for a good couple of hours. The water is a little chilly, but you do get used to it after a while and the refreshing coolness and cleanness of the water is a welcome escape from the hot mugginess of Southeast Asia. One of the key activities we had on our list for things that had to be done during our trip was to get an elephant ride in. Booking this trip was done through our guy Mr. Un at the hotel. We specifically wanted to go to the Elephant Village because this sanctuary is government run and the animals are treated humanely, unlike at other places in SE Asia (and the world for that matter). They offer full, half, and two day tours; we opted for the half day tour (as we were going to see the Kuang Si Falls in the afternoon). I apologize that I don’t have the price because we put together a package for the Elephant Village and the Kuang Si Falls that had a negotiated price. However, it’s Laos and the price for the Elephant Village is most likely going to be pretty good for you no matter what option you want to go with. Getting there requires a bit of a trip, it’s about a 30-minute drive from Luang Prabang. The elephants are as cool as you think they would be. These creatures slowly roam around the sanctuary, allowing visitors to come up (do this with caution of course) and feed/pet them. The Village only keeps females around as the males can tend to be lazy and/or aggressive (sounds like another species we know, right?). After a short orientation, you begin your elephant ride with a designated mahout (the elephant guide). It’s a much more relaxing and enjoyable experience than a camel or horse because the elephants are so big and slow. The elephants can fit two people on their backs along with the mahout up on their necks. The convoy of elephants walk around the village, through a river (which was the coolest part) and back up around the town. During the ride, each person is given the chance to ride on the front on the neck and the guide will climb off and take pictures. Trust me, it’s a little unnerving at first riding on the animal without a guide, but you quickly get comfortable with being on her. After the ride, the tour takes you on a traditional Lao long boat to Tad Sae Falls. Tad Sae Falls itself is like the less impressive version of Kuang Si Falls, which we will be going to in the next post, and it was even more so not impressive because there was no water from it being the dry season. But the main highlight of taking this side excursion was not the falls, but to see the baby elephant and to get a chance to bathe with an elephant. The baby elephant is adorable; they keep him in a pen with his mother. You can’t help but think of the little guy as Dumbo. He’s playful, curious, and from what our guide says, very mischievous. We were warned not to get too close because he had a habit of stealing cameras. We were also warned that if we get too close or too touchy, the mother would get really pissed. That being said, it still didn’t stop anyone from giving the little guy’s trunk a pet when he reached out of his cage for us. The tour also offers an option to bathe with an elephant. Do it. Bring your bathing suit and pay the extra $30. You’ll sit atop the elephant while it goes into the river and plays around. The guide will also give you a bushel of bananas to feed the animal as reward for diving under and cooling everyone off. It was such a fun experience, and not one that I’ll soon be able to do again any time soon I’m sure. After our elephant bath time, the long boat takes everyone back to the main camp and the Elephant Village provides its guests with lunch. For those that book the full day tour, they stay to learn how to be a mahout — the practices, commands and such. For us, we headed our way to Kuang Si Falls, one of the signature sights of SE Asia. That’s next up on Here and There Travel. After we decompressed for a little bit at Le Bel Air, we made our way across that freakin’ bridge and headed into town. The walk to the main part of the town is about 15 minutes. Our destination was Wat Xieng Thong, which is one of the key wats in the all of Laos. It’s at the further end of the town, so don’t mistake one of the many wats you’ll pass by for it (we were fooled once and walked into the wrong wat). Once we did find Wat Xieng Thong, the admission is 20K kip. Unsurprisingly, the wat is a peaceful, zen-like monastery with several shrines featuring a multitude of gold Buddhas. Monks, in the traditional orange attire, mill around and go about their day-to-day tasks. It does feel a little strange as a tourist to essentially be wandering around their residence, but the monks we encountered seemed used to the scenario. After Wat Xieng Thong, and a quick stop for a croissant at Le Banneton Cafe (Laos is known for their bakeries from their time as a French colony), we walked down along the Mehkong River and headed toward Phu (or Phou) Si Hill. You should try and time this walk a little before sunset, the views along the river at that time are amazing. It’s like something out of a movie set with the mountains, fisherman, and monks along the river’s sandy beach. We reached Phu Si Hill along with everyone else a few minutes before sunset. This is probably the only time Luang Prabang felt really touristy, but even then it wasn’t so bad because most people kept quiet at the top to enjoy the view. The climb up is rather challenging, but doable, and it costs 20K kip to ascend to the top. Once you get to the top, it’s inevitably going to be crowded, but people were pretty polite and quietly sidestepped all around to get out of the way of people taking pictures. 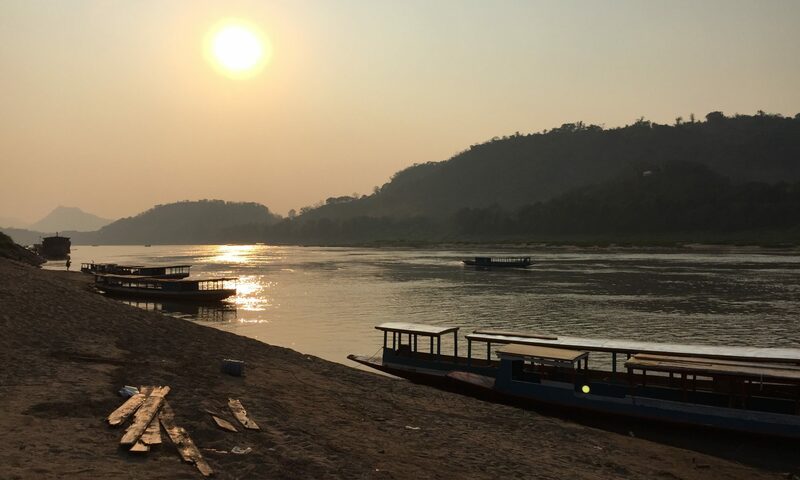 The sunset is a sight to see and is probably one of the must-do experiences of Luang Prabang. When you’re done with the sunset, by the time you reach the bottom you’ll literally be right on top of the Night Market. I cannot say enough about how impressed I was by this market and how enjoyable of an experience it was. The market sold the typical touristy souvenirs and such, but the ambiance was like no other market I’ve been to (and I’ve been to quite a few). It was so quiet; you couldn’t hear anything louder than whispers. The vendors were all sitting politely, not in your face or loud, and their goods were all so neatly laid out we almost felt bad picking up the products and disturbing their presentation. For the backpackers, the Night Market offers a 10K kip street buffet dinner (remember $1 = 8K kip) which was packed with hungry young people. This market ended up being where we did the primary amount of shopping for folks back home based solely on the comfort at which we were able to shop. For dinner I would recommend stopping in at Coconut Garden, located at the end of the Night Market (that is if you don’t do the street buffet). Coconut Garden is a Lonely Planet selection and the guidebook lives up to their usual standards when it comes to food choices. The restaurant offers both meat and vegetarian tasting dishes on top of their usual menu. We orders a veggie tasting menu along with the Laos signature Steamed Mehkong Fish in Banana leaves and a Chicken/Vegetable Fried Rice w/ Fried Egg. After that, we grabbed a beer across the street at a great little bar called Tangor to people watch before heading back to The Le Bel Air for some patio beers to finish up the day. 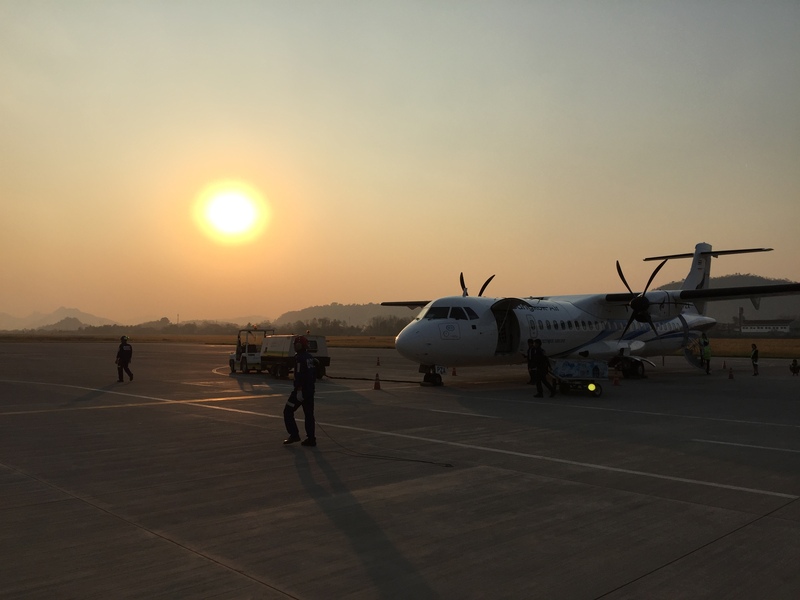 Our next stop was the country of Laos to a little city called Luang Prabang. If you’re heading there from Bangkok, leave plenty of time to get to the airport and deal with all the flight check in and security (2-3 hours). The flight is only a few hours and remember to bring cash for the arrival visa ($36). You’ll also need a photo for the visa which you can either bring with you or they’ll copy one out of your passport for $1. You’ll immediately notice the difference between Luang Prabang and Bangkok as you drive away from the airport. Luang Prabang is less busy, less modern, and noticeably more peaceful. The people are also more friendly, and not in the way that they’re trying to sell you something. They have more of a quiet politeness that isn’t overbearing, but accommodating at the same time. Of the three countries, Laos was hands-down my favorite part. It’s impossible not to feel relaxed in the zen-like ambiance of the town. It’s a backpacker’s paradise, and while there are tourists there, it’s not overrun with them. And those tourists that are there tend to be the hippie, mix in with the culture type. With the 11 PM curfew in the country, there isn’t a huge draw for the spring break party crowd. Note: The curfew doesn’t mean that you can’t be outside past 11 PM. It just means that businesses have to closed by then. Businesses and people in Laos accept Thai baht, but it is a little bit of pain, so try and use whatever baht you have quickly and head to the ATM. The Laotian money is the kip ($1 = 8,000 kip). It’ll probably take you a little while to get used doing conversions with thousands at first. Our hotel was The Le Bel Air Resort. This is place is really nice; we arrived to a refreshing cold towel and lemongrass tea. Located a quick 10-15 minute drive from the airport, the Le Bel Air sits on the bank of the Nam Khan River. The resort itself is made up of several bungalows of varying sizes depending on what you want to pay for, but all the options are very affordable. And while the bungalows themselves look rustic, they’re actually quite modern. Each are equipped with A/C, HD TVs, and patios overlooking the river. The hotel offers free shuttles to the center of town as well as free bikes to borrow. The service there is also exceptional. We essentially had our own personal staff member, Mr. Un, who was attentive and helpful. 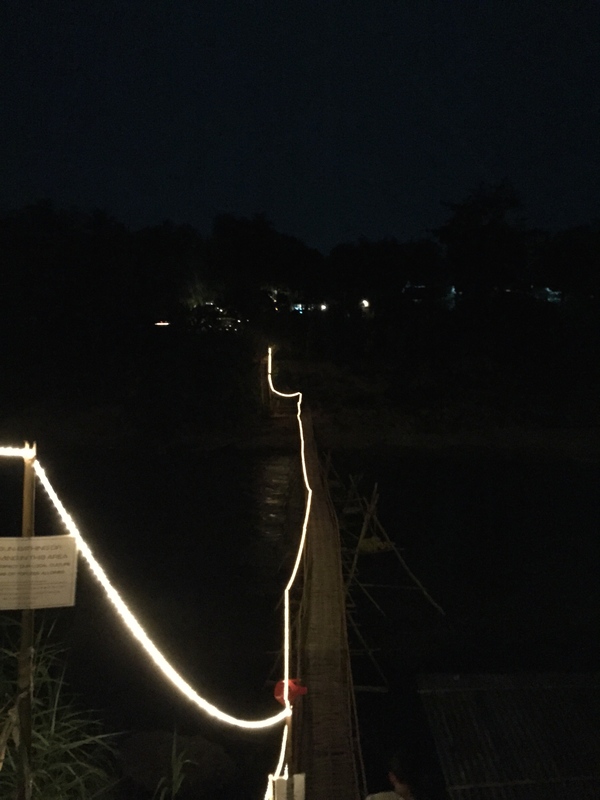 Alternatively, there is a bamboo walking bridge that you can cross, but it costs 500 kip, and is only available during the dry season when the river is low. So as much as I hate to say this, I would recommend staying at a place closer to town if you don’t like heights. Again, I hate to say that because The Le Bel Air is such a nice place and the hotel does offer a free shuttle, but that is a bit of pain because the shuttle isn’t run regularly and it has to take a major detour around the river to get to the center of town. So from a time-saving standpoint just walking to town is a lot quicker and easier, but a lot of people would not be comfortable with that bridge. My next few posts will cover the sights and sounds of beautiful Luang Prabang, including elephant riding, Kuang Si falls, and rice whiskey tastings.